HomeNorthwest Getting Warmer and Wetter? Not Really! 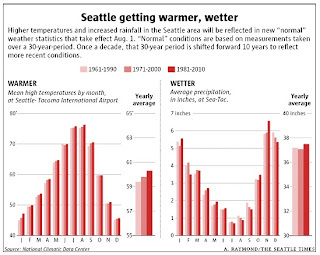 On Thursday the Seattle Times had a banner headline: "Our new "normal" weather: wetter and warmer"
It turns out there are a lot of issues with this claim if you really examine the facts. Lets do it! The story was based on the fact that the National Weather Service has just changed the period used to calculate our climate--what they call the "normals." A thirty year period is used and each decade they shift it forward to cover the last thirty years. The official climate normals were 1970-2000 and are now 1980-2010. The folks at the Seattle Times presented and discussed the results from Seattle (t is important to note is only ONE location in the region and might well not be representative!). Here are their results, showing the normals from the last three versions of the climate normals (1961-1990, 1971-2000, 1981-2010). Lets look at precipitation first. Precipitation at Seattle dropped from the first normal to the second, and then increased for the new one. Seattle is getting wetter? Not so fast. First consider the differences between these values--only a few tenths of inch separate them and I am pretty sure these differences would not be statistically significant. But there is something else. 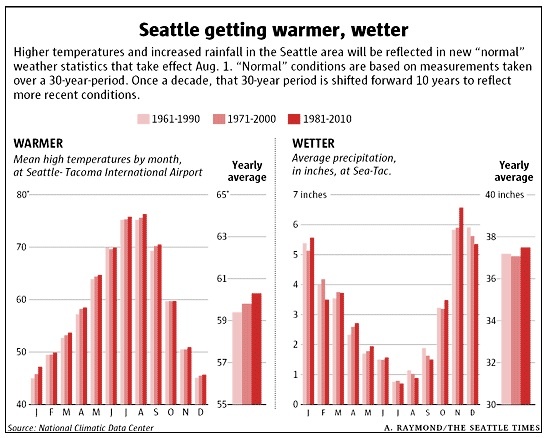 It is well-known fact among local meteorologists that something was wrong with the Sea-Tac rain gauge during the 80s and early 90s--the "SeaTac anomaly" in which the gauge reported too low, compared to gauges in the neighborhood. Recently it was fixed. This anomaly would clearly contribute to the trend. Now if we can't be sure about Sea-Tac, what about the new normals for the other climatological stations in the region? Here are the annual normals for the last three versions for Hoquiam (hqm), Olympia (olm),Bellingham (bli), and Spokane (geg). Completely different story! The annual precipitation has gone down! Stop the presses! New headline---the Northwest is getting drier! But I wouldn't say that either...these differences are surely not statistically significant, meaning they are small enough that they could be due to random variations that are not connected with any true trend. What about the warming? Could there be a problem with that too? It turns out that if you look at other stations, one gets a mixed bag, some are cooling--like Hoquiam(hqm) and Bellingham(bli)-- and others show slight warming--like Spokane (geg). Here are some samples. This makes a lot of sense to those of us who are working on the regional implications of global warming---the eastern Pacific has not warmed--in fact it has cooled. So what about the rising temperatures at Sea-Tac Airport? I suspect it is probably bogus due to sensor issues, the development around the airport, and the addition of the third runway. A careful comparison high temperatures at Sea-Tac and the temperatures of surrounding stations indicated a several warm degree anomaly at the airport (done by Mark Albright, past state climatologist). For example, the first 8 days of July, Sea-Tac was 2.3F warmer than two nearby stations. The truth would not make a good headline: NO APPARENT TREND IN NORTHWEST CLIMATE DURING THE PAST SEVERAL DECADES. The bottom line: be very skeptical about dramatic headlines about climate change--when you dig a bit, you may find the truth is more complicated.